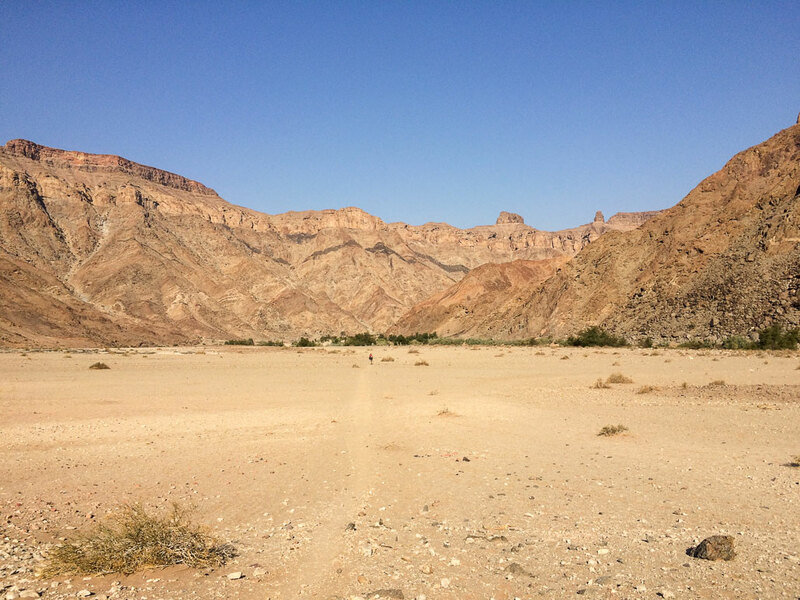 The Fish River Canyon in Namibia is the largest canyon in Africa and you know it when you’re there. The hike is 90kms long, but if you take all the shortcuts it works out to about 75km. It starts at the view site at Hobas and finishes at the Ai-Ais resort. Original Hiking Federation map. Click to download PDF version. Over the last year we have happily been invited on four multi-day hikes. In December 2016, we did the Otter Trail, in March 2017 we did Witels, we have just completed the Fish River (September 2017), and we’re heading for the Whale Trail in October 2017. Of the three done in the past year, the Fish River has been my favourite. 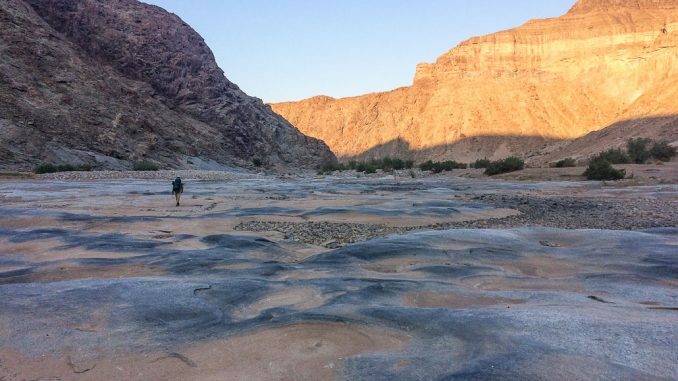 The expanse and environment that one walks through is immense and creates a feeling of surrendered independence – it is just you, surrounded by ancient rocks, sand, water and your backpack. It is a stark landscape, and one needs to be entirely self-sufficient. It is awesome. Although it is far, the drive up from Cape Town is beautiful and it really doesn’t feel too bad. That is, until you get two flat tyres just 20km from Ai-Ais and you’re stranded in the middle of the freakin’ desert. Luckily for us, our first flat happened just as our friends passed us and they had the savvy to realise that when we hadn’t arrived at Ai-Ais two hours after them, they came back looking for us. It worked really well sleeping at Ai-Ais before (and after) the hike. Their campsite is a fantastic option – just make sure to book all of this well in advance, as they don’t do last minute bookings. The resort arranged a shuttle for us to the start of the hike. We only began hiking at 12:00 because our shuttle from Ai-Ais was a little late…but all in good time, as they say. I had been warned many times about the extreme hike down into the canyon on day 1 at the start of the hike. While it is very steep, it’s not half as hectic as the entry into the Witels, and so I was pleasantly surprised and found it manageable. At the bottom of the descent, we were greeted by the most beautiful, sandy beach with a big pool of water (and a friendly baboon) and had a most welcome swim to revive ourselves. After lunch we walked on for a few km’s and then found a soft spot on the banks of the river to sleep. Most people I’d spoken to prior to hiking the Fish advised that it gets freezing at night. Apparently, it can also get really windy at night and tents are recommended so that one doesn’t breathe in wind-blown sand. However, we struck it lucky because it didn’t rain during our trip and we had no wind – in fact, it was balmy in the evenings. Some of our group even chose to sleep out in the open. Day two started with slow hiking through thick sand and over big boulders, and it was very hot. Luckily for us, there was still a fair bit of water in the river and so we found many pools for cheeky little swims along the way! We spent that night at Palm Springs and, once the sun had set, we really enjoyed the heat of the natural sulphur hot pools that you find there (it sounds stinky, but it was pretty glorious). We had only covered about 18km in total over the first two days, but the terrain changed so much thereafter that in the following three days we managed to cover about 20km each day, and that included some really long lunch breaks. On our third day, we started walking before sunrise in anticipation of what we knew was going to be a hot day. Besides it feeling rather adventurous waking up and getting ready in the dark, watching the canyon light up as we walked the morning in was pretty special. 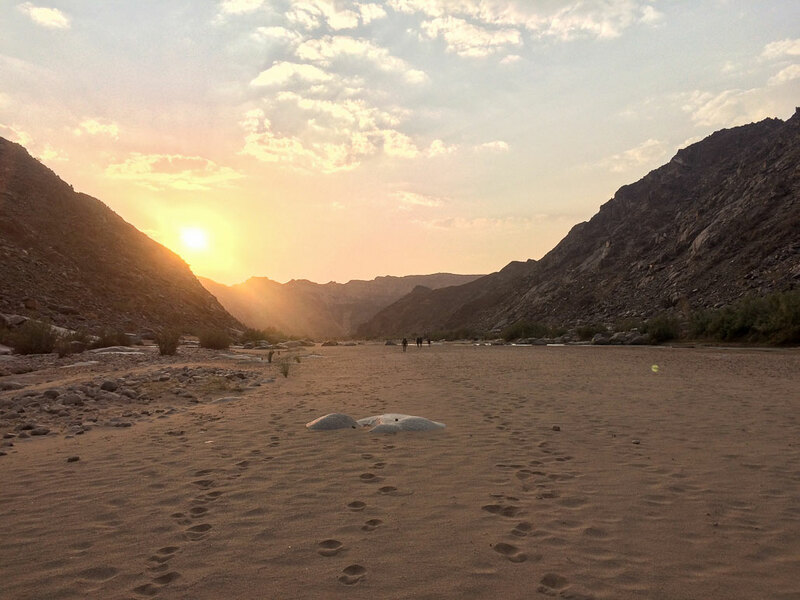 Throughout the day, the terrain changed from rocks to boulders to soft sand to hard sand to expanses of desert – needless to say, there was not much desire for chirpy conversation, and a contemplative ‘one-foot-in-front-of-the-other’ approach was the order of the day. Day 4 was a long day and we started early again. 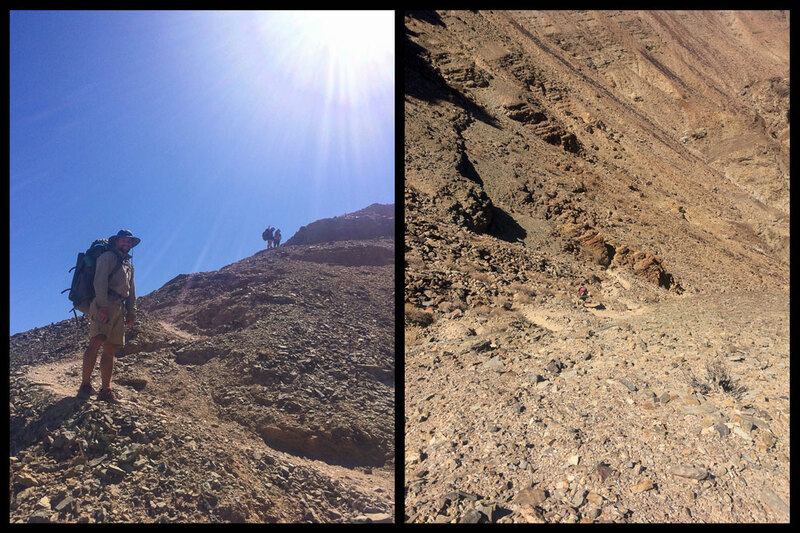 This was the day with the most shortcuts – which made it shorter (obviously), but also meant that we had a change in scenery as we hiked up and over koppies rather than only on the flat in the canyon. In addition to endless sand and rocks, there is a surprising amount of life in the canyon. We saw wild horses, zebra, kudu, baboons, hundreds of species of birds and all sorts of lizards, bugs and spiders. 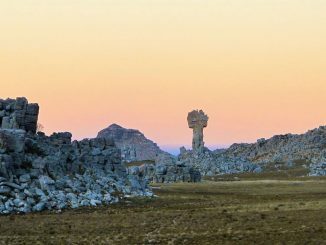 However, it was the rock formations that really caught my attention – they range in shape and form, and are so spectacular that I constantly found myself wondering why on earth this one looked like this, or that one like that. The further we went, the river got noticeably drier with less pools to swim in. Luckily, it was a lot cooler than the first few days, and so the need for swims wasn’t as great. On one of the shortcuts we encountered a troop of very curious baboons. They weren’t threatening or aggressive at all, but it was a reminder to close our bags up when we stopped for rests or at our overnight camping spots, so that the baboons didn’t steal any precious food. On the morning of day 5, we spent a lot longer at camp, enjoying the sunrise and relaxing into the last day of the hike. The hiking on day 5 is by far the easiest, with pretty flat, hard terrain. It took us much quicker than we had anticipated to get to Ai-Ais – when we reached the 80km point there was a little bit of sadness realising that it was almost all over! We did the hike in 5 days, but some people do it in 4 days and others in 6 days. The stretches are long. If your mind is in need of a meditation then this is the perfect multi-day hike for you. If you want to take the shortcuts make sure to take a map. 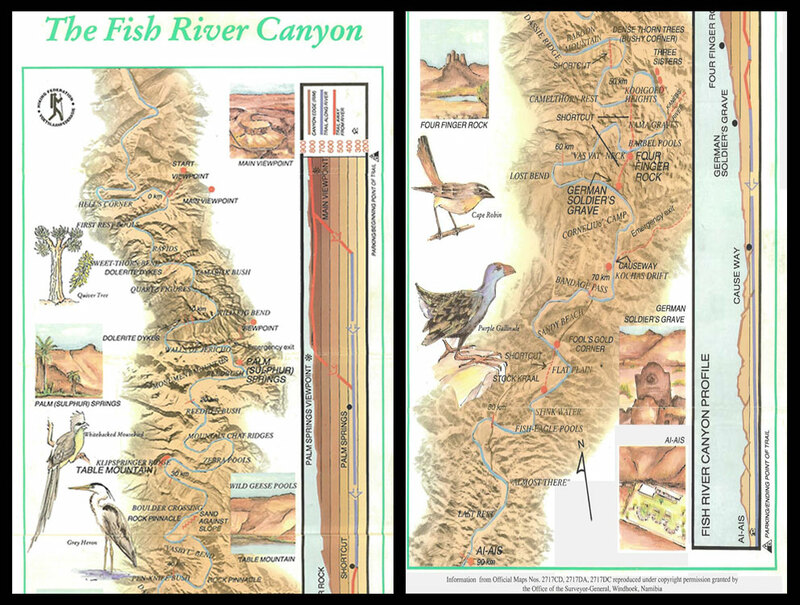 Slingsby Maps recently released an official Fish River Canyon hiking trail map. We had three different maps between us and they were all…well, quite different! Typically, we’d compare maps and then judge which one made the most sense at the time. I think it might be surprisingly easy to get lost in the canyon as well, so I don’t suggest venturing too far away from others in your group. One of our group had done the Fish before, and on the last day of his previous trip he had hiked an extra 15km because he drifted from the group and took a wrong turn! Even if you don’t expect high temperatures, I’d really recommend starting out before sunrise. In addition, shady spots (and trees) are a scarce commodity, so if you’re hungry for lunch and find an alluring spot with a pool or shade, then take it! We were there over the full moon period, which was great because the canyon was illuminated at night, making it easy to get around in the dark, but I think the stars must be pretty spectacular if you book on a new moon. You must have a doctor’s certificate saying that you are well enough to do the hike. Make sure you’ve got your car papers (& passport) when crossing into Namibia and that your car insurance covers Namibia too. I imagine that this hike is radically different depending on when you do it. If you do it at the beginning of the season when there is lots of water then I imagine you’ll be facing many, many river crossings. Speak to some other people who have hiked it before to find out the relevant information depending on the time of year and weather, but mostly just go ahead and book it. Lastly, please don’t litter! Carry only what you need, decant everything possible so you are not carrying unnecessary weight (like glass bottles), and make sure you take rubbish bags along – as with all natural environments, what goes in must come out. Be a considerate hiker (and human)! 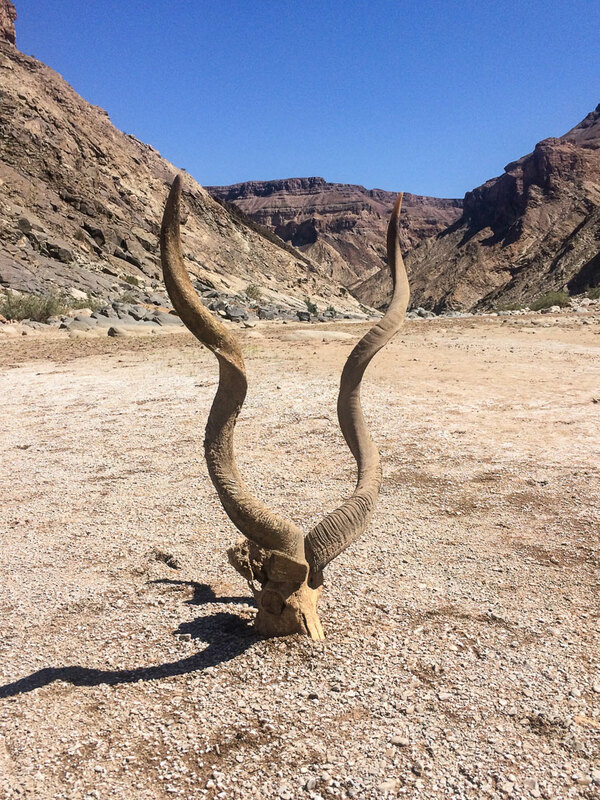 The folks at “No Speed Limit” compiled an extremely thorough article that contains a lot of very useful logistical information about doing the Fish River Canyon hike. 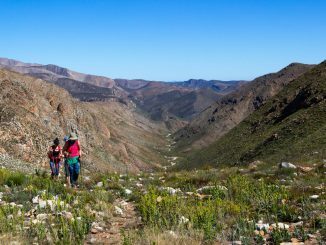 The Fish River Canyon hiking trail is a fantastic, unique experience. Once you descend into the canyon, you truly escape from the outside world. As special as the hike is, it is also unique in its challenges. 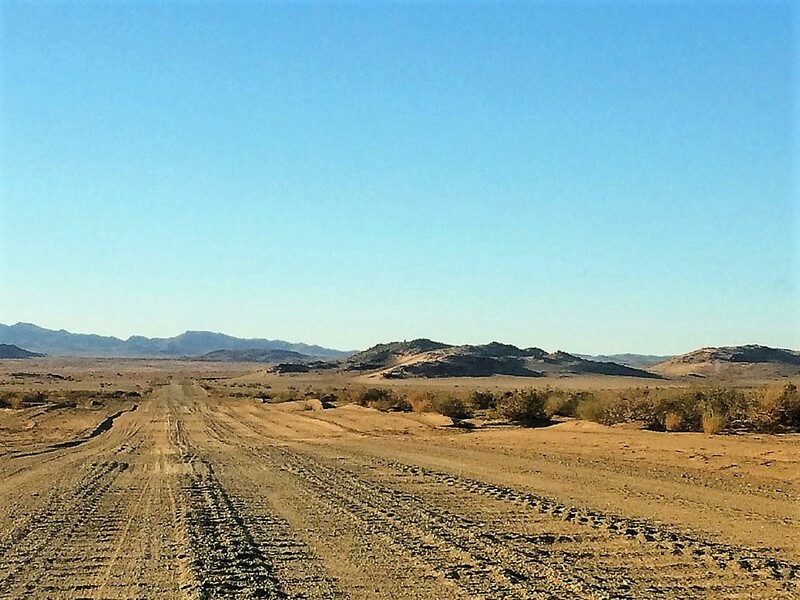 The desert environment is harsh on one’s body and mind and dehydration can quickly set it in if left unchecked. Make sure you have an experienced hiker in your group. Beauty: 4 (out of 5): Magnificent and uniquely beautiful. The only reason it’s not a 5 is due to a lack of variation. Difficulty (fitness): 7-8 (out of 10): Difficult i.e. Need to be fit for long distances. The desert environment is also uniquely challenging. Technical rating of trail: The terrain varies from hard-packed sand to soft sand as well as boulder hopping, which can be quite challenging with a heavy backpack. There are also minor river crossings along the trail. 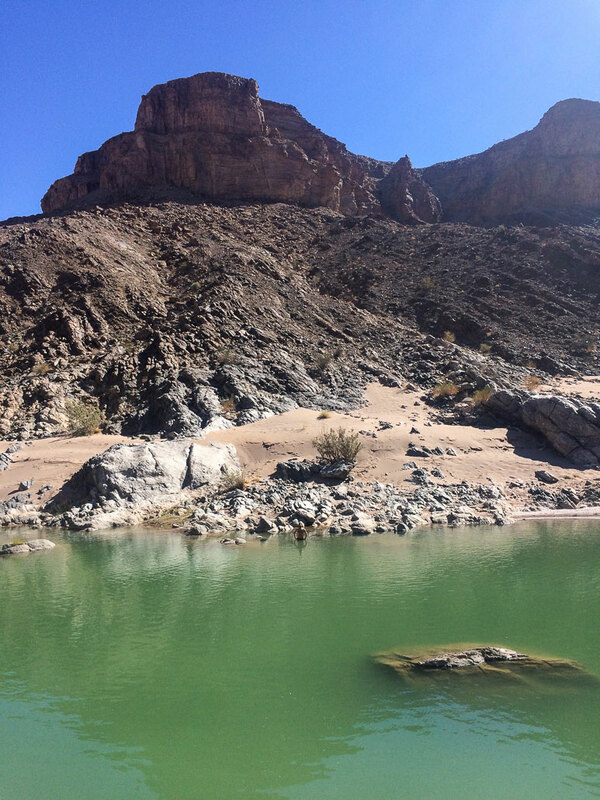 just got back from the Fish River Canyon hike- it’s as awesome as described- loved it! 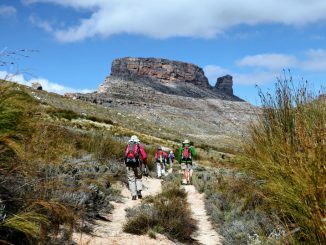 Do you perhaps know what the minimum group size is for hiking the fish river canyon? 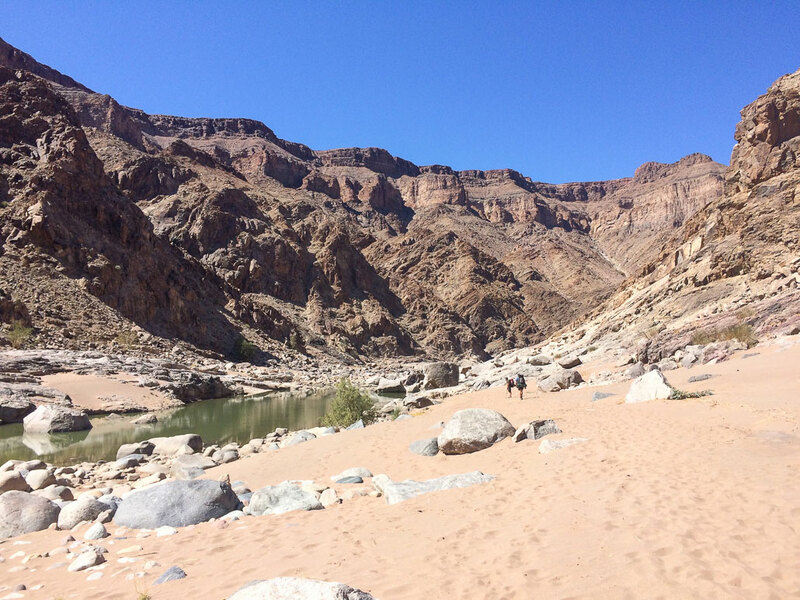 Hi Mariaan, the minimum accepted group size for the Fish River Canyon hike is 3. Did the hike for the first time this year. Will become a regular hike for me! Absolutely stunning place. Just got annoyed with all the wet wipes! I wish people would realise that they are plastic! Once dry, they burn very easily. I ended up walking with a lighter and burning all the toilet paper and wet wipes as I walked. This sounds amazing! I really want to do the hike this July – but the cold nights really do terrify me! Do you know how cold it was ? It never gets terribly cold. Sometimes you might experience some light rain, but a good sleeping bag will keep you totally comfortable at night. Great read! Where would the best overnight spots be for a 3 night/4 day trip? We are a small group of fit guys. how much does the hike cost per person?? The hike costs R330 per person and is secured via a deposit of 10% (2018 rate). A minimum of 3 persons in your group is required to make a booking. The rate will increase from 01 November 2018 to R500 per person. Once at Hobas, you will need to pay park entry fees of R60 (SADC citizens) and R80 (foreign visitors). It is recommended that you overnight at either Hobas or Ai-Ais before and after the hike. Camping at Ai Ais will set you back R210 per person per night. I would love to do the hike 2019. But i do not have 2 more people to go with. Can i join a group that is already there?? Hi Lisa when we’re looking to do the trail my friend and I also want to hike the fish perhaps we can hook up ? Hi Lisa, my boyfriend and are i looking for a third person to join us on the 5th of May. My boyfriend and I have booked to go on the 5th of May, we are looking for a pair or third person to join us. Are you still looking for a third person to join? Hi. Would like to do the Fish end April/May 2019. Any group with space for one person? I have been privileged to get 6 spots for July this year. Leaving SA on the 13th July, and will start hiking on the 15th. Walk out in Ai-Ais on the 19th. Can’t wait and am currently exercising with 10kg in my backpack. Don’t forget the mosquito repelent. Hi Adri, we are going in 2 days before you. 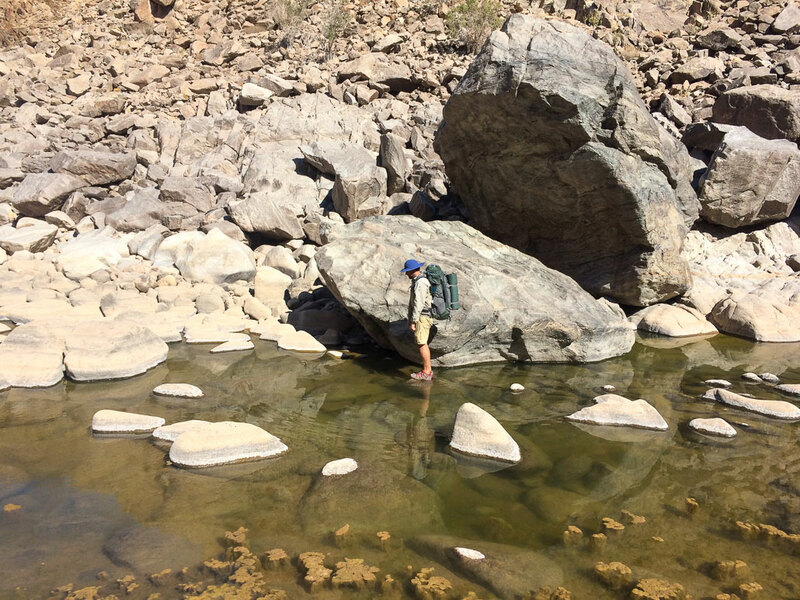 if you haven’t hiked it before I would really recommend speaking to so of the Fish river veterans, people who have done 5 or more hikes through the canyon. They really give good advise on places to sleep an where to cross etc. The Slingsby map is quite accurate in my experience and will be a handy addition to your inventory. We never hike with tents and we have people in the group thats done 23 Fish River hikes. A nice ground sheet of drimag material helps alot to keep the sand out of you bag. Hope you enjoy the hike!! Love the Fish River. Going for my third time this year! 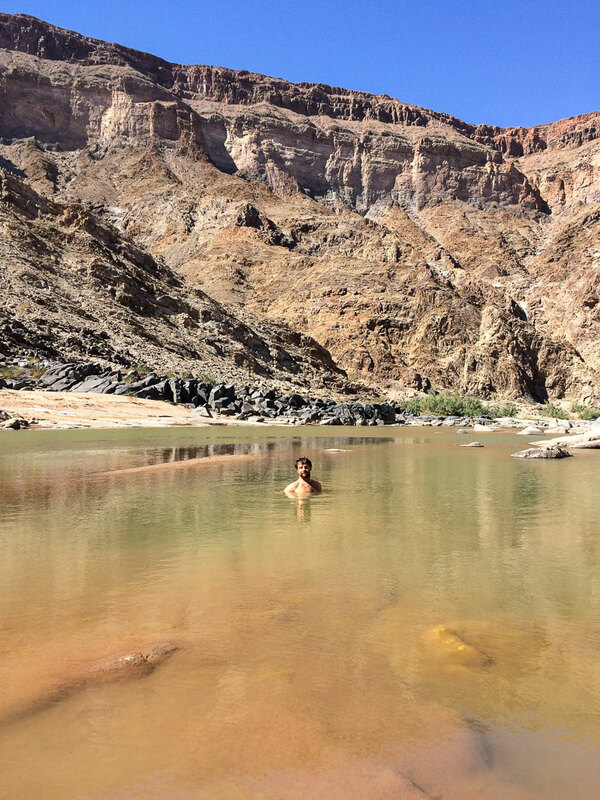 Just a note: the Fish river canyon does not feature close to the top of the largest canyon lists in world. It is the largest canyon in Africa though. I will be hiking for 3rd time. Starting on 21 May 2019. Have one more spot if anyone interested.